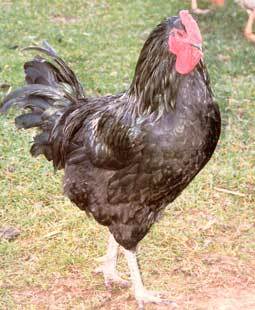 They are a large fowl breed plus docile and easily handled. Javas like to forage but bear up well in confinement. As foragers they remain active throughout the day but do so in a calm, peaceful manner. They have a tendency toward broodiness. They have been described as the “workhorse of the poultry world.” Common, sturdy, and productive the Java just quietly does its job. Many heritage breeders want to see the docile Java once again grace the serene farmyards of America. Javas roosters weigh an average of ten pounds with the hens coming in at a close eight. Javas have a rectangular shape with a full breast, tight feathers, and a single medium comb with matching medium wattles. They sport small red earlobes. The Black Java has black feathers that shimmer with a beetle-green glint in the sunlight. Mottled Javas have the same basic black color but with white markings on the tips of the feathers that give the plumage an appearance of spots. The American Poultry Association removed the White Java from the Standards of Perfection in 1910 because it resembled too closely the White Plymouth Rock. Work with the American Livestock Breeds Conservancy (ALBC) who started a project in 2009 to recover the Java. Plan for your Java by providing spacious, food-filled runs, and well insulated coops. Javas need to forage and will reward the Java owner by securing much of their own food. Provide good layer food to support their egg production. Break the Java broodiness by keeping on top of egg collection, by using a wire bottom in the nesting boxes, and by keeping the hen out of sight of an old nest.